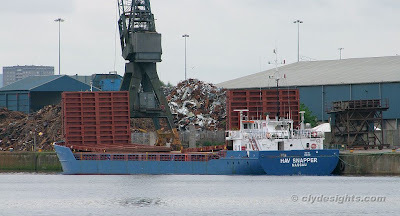 Also discharging at Shieldhall was the coaster HAV SNAPPER, unloading a cargo from Vierow in Germany. She was completed in 1991 at the Damen shipyard at Gorinchem as SAAR LONDON, later being renamed GROOTHUSEN and then WALZBERG, before becoming HAV SNAPPER just a few months ago. She is 88.16 metres in length, and has a deadweight of 2,767 tonnes.